Only four points scored in the first half. Only one shot from the floor made in 31 attempts in the first half. Only one three-point shot made in the entire contest out of 33 attempts. I had not followed Northern Illinois at all this season, before Saturday's game. I was therefore curious whether the horrendous shooting against Eastern Michigan was just a "one-off" by an otherwise good shooting team, or part of a pattern this season. As shown in the following chart that I made from NIU's game-by-game log, the answer is the latter. On January 19, Northern Illinois lost to Western Michigan, 71-34. Quoting from this game article, the Huskies' 34 points constituted their "lowest point total since losing 61-31 to Southern Illinois in 1946." Then, just two games later, against Eastern Michigan, NIU took its offensive futility to a new (low) level, scoring just 25 points. To find that small of an offensive NIU output, one has to go back to January 11, 1941, when the Huskies lost at Chicago Normal (now Chicago State) 26-25 (see last year's NIU media guide for detailed game-by-game information throughout program history). Interestingly, in between the WMU and EMU games, NIU got a rare win, topping Central Michigan, 74-61. In racking up a healthy point total, the Huskies shot an impressive.526 on three-point attempts (10-of-19). This outburst from behind the arc, along with one in a Jan. 9 win over Miami (Ohio) in which the Huskies shot .692 from long distance (9-of-13), are clearly the exceptions. In 15 out of NIU's 18 games thus far this season, the Huskies have shot .333 or lower on three-point attempts. 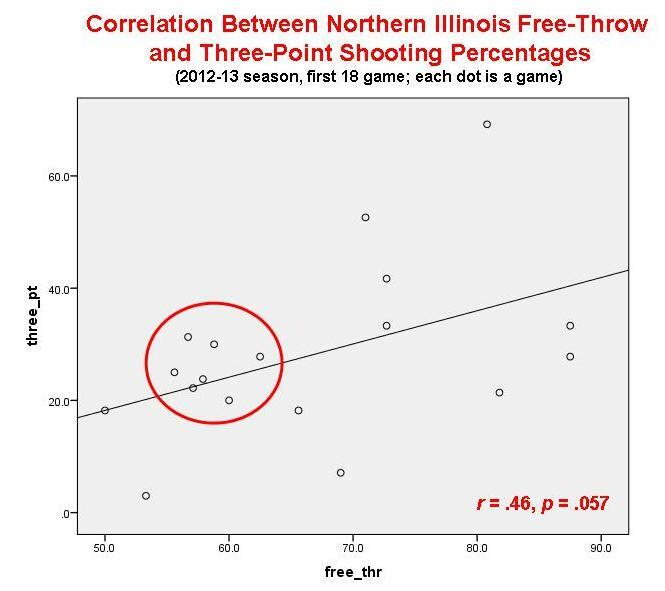 It is also apparent that Northern Illinois is not a good free throw-shooting team, either. In eight of the team's games, the Huskies have shot .600 or lower from the stripe. To explore the idea of a generalized shooting ability, covering two- and three-point baskets and free throws, I obtained correlation coefficients between each pair among the three variables. As shown in the following graph (on which you can click to enlarge), free-throw and three-point success were positively correlated, r = .46 (the probability of this result occurring by chance was .057, slightly higher than the conventional cut-off of .05, but isn't bad for such a small sample). In short, the better NIU shot free throws in a game, the better it shot three-pointers (and the worse it did one, the worse it did the other). In a way, this is surprising, because free throws are attempted without the shooter being defended (hence the term "free"), whereas three-point shooters often have opponents in their face. 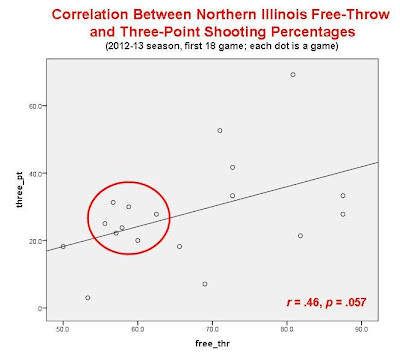 I've circled a bunch of dots in the graph that seem to characterize several NIU shooting nights; in these games, the Huskies' shooting percentages were in the 50s and low 60s on free throws and in the 20s and 30s from downtown. 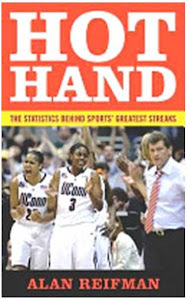 Starting from this relatively low characteristic level of shooting, all it takes is some bad luck or tenacious defense from the opponent to drive the Huskies down to the abysmal shooting they've exhibited of late. The correlation between two-point shooting and free throws, and between two-point and three-point shooting, were both in the positive direction (higher on one, higher on the other), but not close to the .05 level of statistical significance. Because two-point shots can range from slam-dunks to shots just inside the arc, it's not surprising that their data are somewhat noisy. The first touchdown was scored after [Tennessee's] Zach Brown intercepted [Jacksonville's] Chad Henne and ran the ball back 79 yards for a defensive touchdown. After the Jaguars offense was forced to punt on their very next possession, the punt was returned 69 yards for another touchdown by Darius Reynaud. The Jaguars offense once again took the field without a break and once again they were forced to punt and, once again, Darius Reynaud returned the punt for a touchdown, this time for 81 yards. Finally, the last touchdown was scored on another Zach Brown pick six, this time from 30 yards out. 71 of these passes were intercepted and brought back for touchdowns (an NFL record for one season). Based on these figures, the ratio of attempted passes that ended up as pick sixes was .004 (4-in-1,000 or 1-in-250). There were 1,133 punt returns in the NFL this past seasons (excluding fair catches, in which the returner raises his hand to signal that he will not run with the ball after catching it, in exchange for not being clobbered). 18 punt returns resulted in touchdowns. The TD ratio is thus .016, a little over 1-per-100. .004 X .004 X .016 X .016 = .000000004 or 4-in-1 billion. Next, let's tackle the issue of all four of these touchdowns being scored by Tennessee, instead of say, two by Tennessee and two by Jacksonville, or three by one team and one by the other. Let's assume, for each of the touchdowns, that it was just as likely Jacksonville could have scored it as Tennessee (i.e., a coin flip). The probability of the Titans winning all four coin flips, if you will, is 1/16. Multiplying our previous value of .000000004 by .0625 yields .00000000025 or 2.5-in-10 billion. Lastly, four touchdowns by the same team, via two interceptions and two punt returns, would not necessarily have to occur in four consecutive possessions by the victimized team. 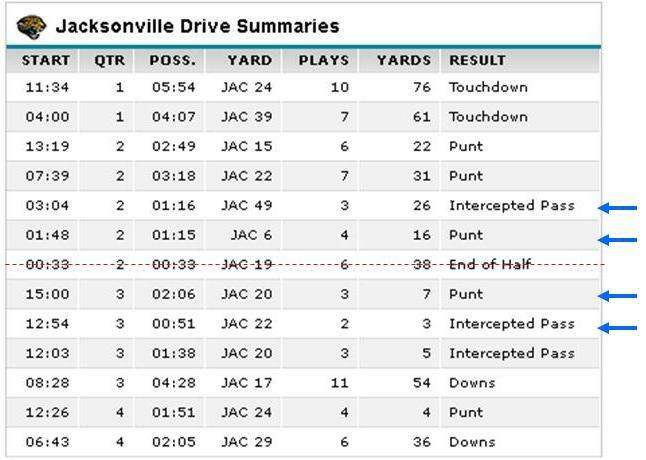 Here is a screen-capture of ESPN.com's drive chart for the Jaguars vs. the Titans. The four drives leading to Tennessee touchdowns are denoted with blue arrows. 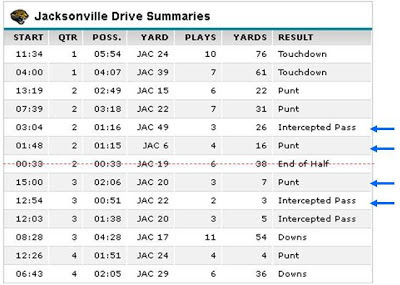 Note also that Jacksonville's drive beginning with 33 seconds left in the first half is excluded, as there was little remaining time for anything major to happen. We are thus left with 12 Jacksonville possessions, with Tennessee's non-offensive touchdowns occurring on drives 5, 6, 7, and 8. There are many possible combinations of drives on which the four Titans' TDs could have occurred, nine of which are consecutive (e.g., 1-2-3-4, 2-3-4-5, ..., 9-10-11-12), and many additional others that are non-consecutive (e.g., 1-4-9-10, 4-6-9-11). The total number of possible combinations can be obtained via the n-choose-k principle, in this case raising the question of how many ways can four drives (k) be selected from 12 total drives (n). Using this online calculator, we learn that there are 495 possible ways to select four objects from a total of 12. Nine of these sets are consecutive, as noted above. The probability of the four TDs occurring on four consecutive drives is thus 9/495 or .018. We thus multiply our previous interim probability of .00000000025 by .018, yielding .0000000000045. This translates to roughly 4.5-in-1 trillion. Suffice it to say, we are unlikely to see anything like this ever again. The funny thing is, as shown in the above drive chart, Tennessee intercepted a Jacksonville pass on the Jaguars' next drive following the four touchdowns, but the interceptor didn't make a touchdown on the return. Therefore, we possibly could have had five consecutive non-offensive TDs by Tennessee. The "Game notes" at the bottom of this ESPN.com article on the Jacksonville-Tennessee game cited two similar occurrences to what Tennessee pulled off: "The Titans also had three return touchdowns Sept. 23 in an overtime win over Detroit. Reynaud had a 105-yard kickoff return in that game [link]. ... The Seahawks had four interception returns for TDs on Nov. 4, 1984, against Kansas City in a 45-0 rout, and three different players scored those TDs [link]." I checked the records from these games and in neither case were the return touchdowns all consecutive. As noted throughout, the above calculations have required several simplifying assumptions. Also, it's certainly possible that I made a calculation or logical error somewhere along the way. If you spot something, please let the world know in the Comments section.